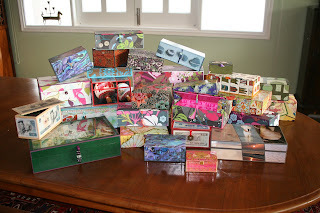 Why the name Geckoboxes for my box-making hobby? Geckos, or small lizards, have been around our house in Italy, Spain, Singapore and Saigon for many years, sometimes hiding in the boxes I was making. 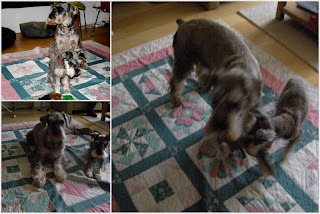 Because they were so little, I was never scared but more surprised by their sudden appearances. These 2 boxes are made with pictures of paintings made by my Dutch friend Joke. 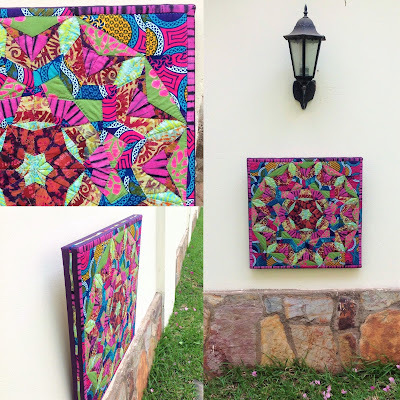 Bringing these colorful pictures together as a mosaic around the corners of a box is one of the things I like to do most. 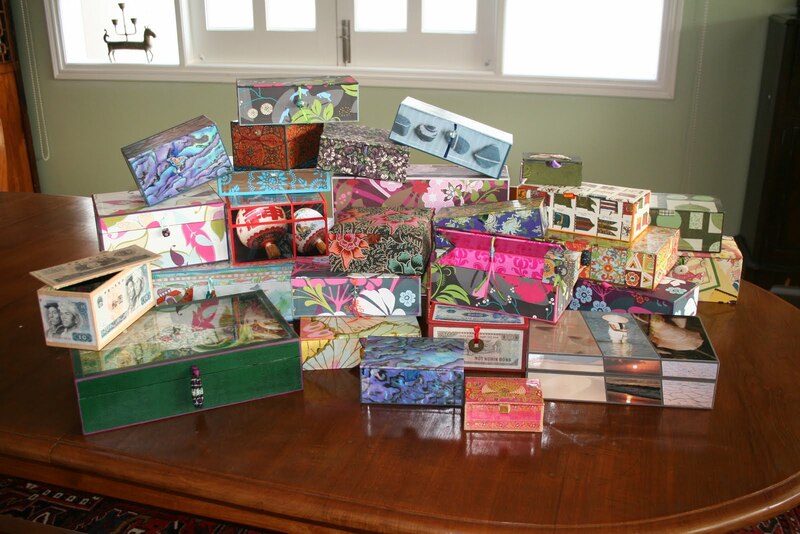 This heap of boxes is made during workshops I gave in Saigon. 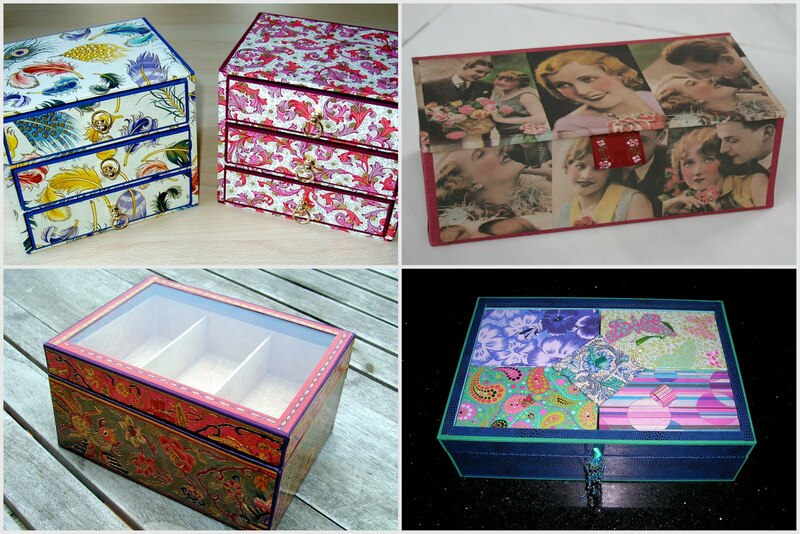 It is a mixture of different levels of box-making: beginners, advanced, with paper, fabric, glass top and picture collage. Right now all my materials are in storage and I am so much looking forward to unpacking them all when we move to Sao Paulo, somewhere in October. Even more so after visiting a another box making lady here in The Hague. She makes beautiful boxes, some of those are for an on-line shop: http://kunstenvliegwerk.nl (click on the URL). She uses printed copies of antique samplers, simply beautiful. I would almost say: ... are a girl's best friend! It is only that I have just started but I know I am hooked already! Before I can continue I have to study Portuguese, clean the bathroom, walk the dogs, get some groceries, appointment with the dentist, sort out the packing list for the movers in random order... ahhhh!!! 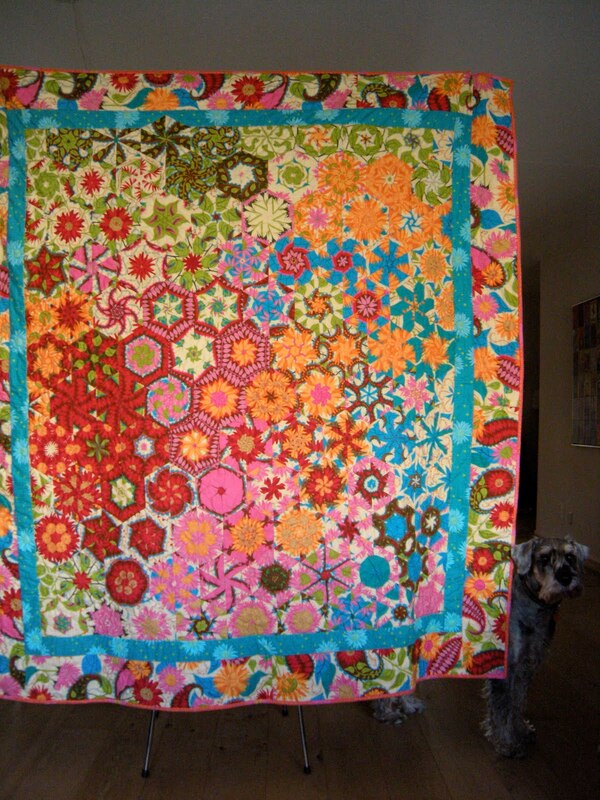 I so much more prefer to go through my stash, cut out pieces of fabrics and make a heap of pentagons to play with. 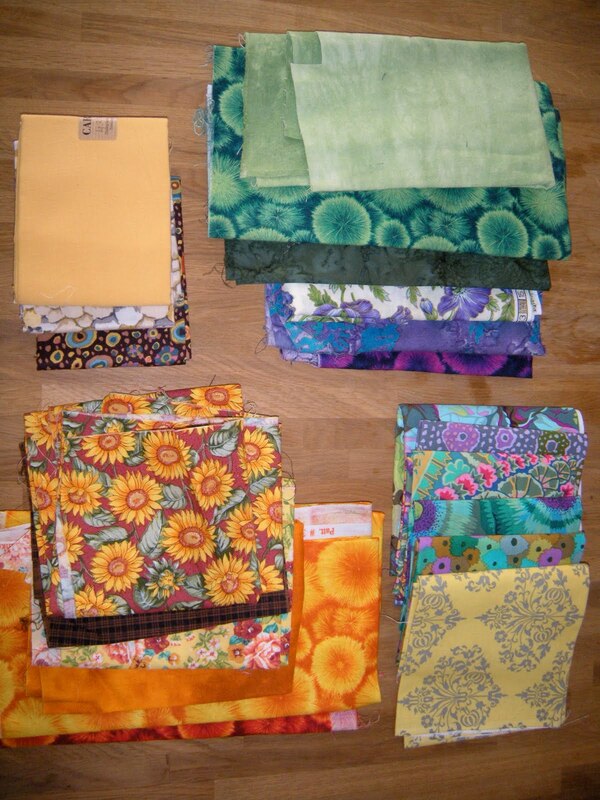 The colours of the Kaffe Fassett and Amy Butler fabrics are just so appealing! Sigh... ok,ok, I will do something from my to-do-list first and then I can go ahead and play for a while! 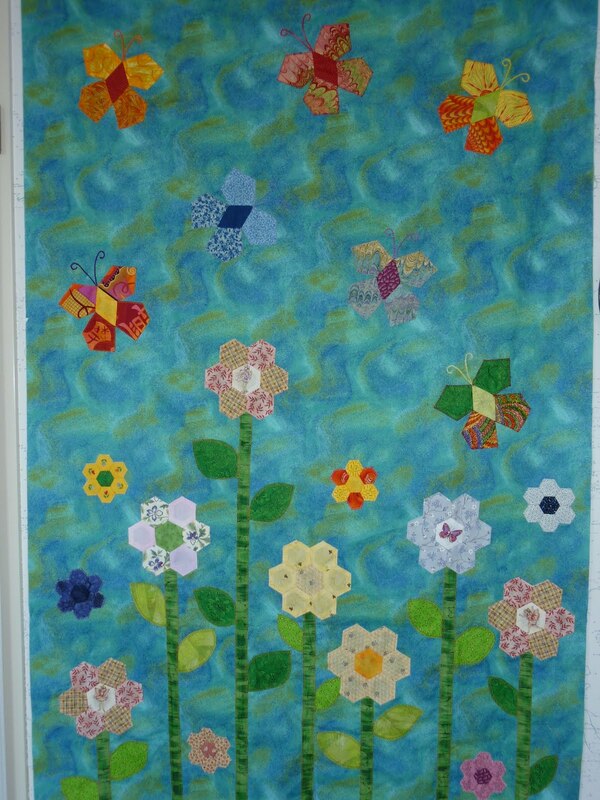 Over the weekend I finished the applique to a top for a charity quilt. 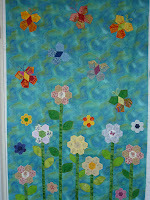 All hexagon flowers and pentagon fishes and butterflies were made by a few ladies from the quilt bee at The Stitch Cottage. 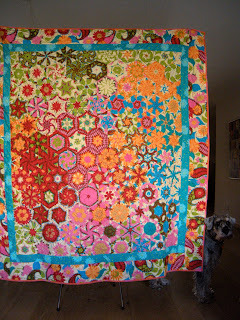 The top will be used for a so called Dream quilt. In total we made 2 tops for this special project. 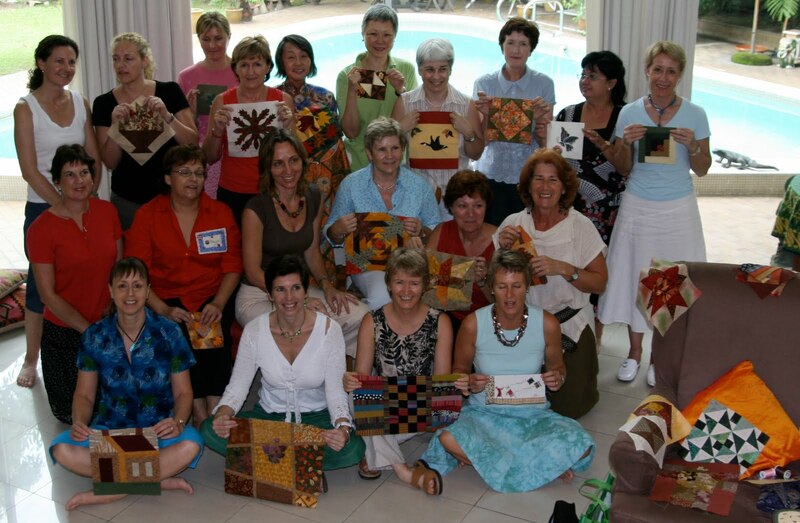 Jeannet organized a pincushionswap and apparently already more than 100 people signed up! It is the first time I join a swap and it promises to be fun! If you want to join in as well, just click on the picture on the right side. Closure date is September 5! A few weeks ago the postman brought me a book about pentagons: Liesels Fünfecke written by Hilde Klatt and Liesel Niesner; a wonderful variation on the hexagon principle with stunning effects. The book is in German but the instructions are clear. 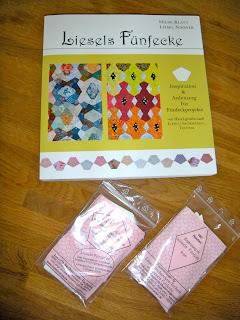 I bought it from Lohuis-Tijhuis quiltshop, but you can also order it from the writers themselves. Just click on the links and you will go their websites. 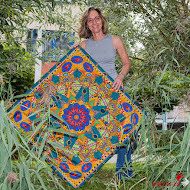 I am planning to make a few pincushion samples with these pentagons, just have to decide on the colors..
During our posting in Singapore from 2000 until 2006 I was a member of the ANZA quilting group, a very active group of ladies from around the world. Every Tuesday one of the ladies hosted the whole group while another brought cookies and cakes. Sometimes more than 20 came and the golden rule was "six stitches before having coffee and cake". We often made barely six as there was so much to share, show and tell. 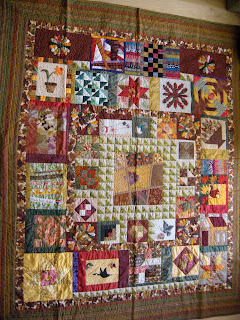 When I left, the ladies all made a me block in autumn colors. As I like to be challenged, the measurements of the finished blocks was open. 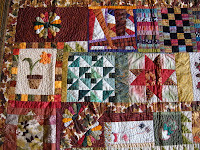 Oh my, I received so many lovely blocks from all of them, all so very different and beautiful. Pictured here are some ladies of this wonderful group. It became a challenge indeed to group all these different blocks together. 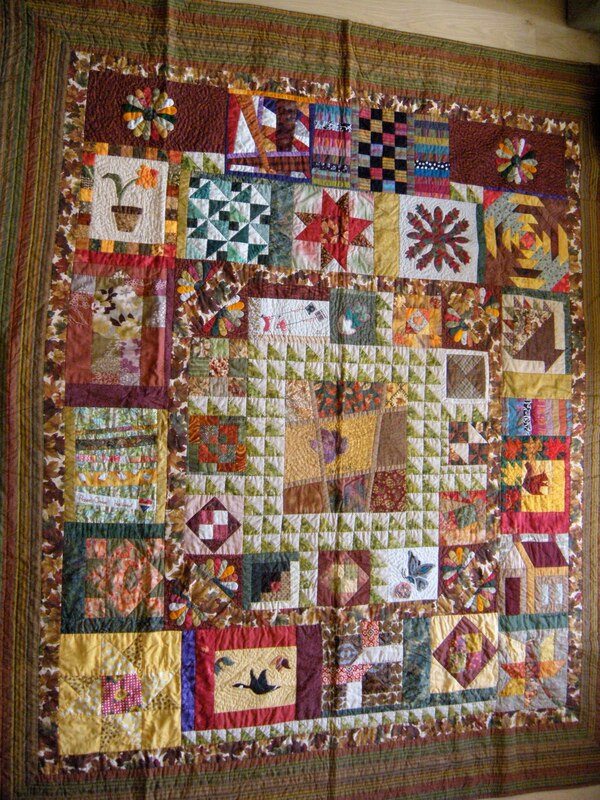 I decided to make a design with a medallion in the center, to add small triangles and appliques of flowers at the corners and to repeat this at the border. This quilt is very special to me, it contains so many fond memories to a group of women who helped each other and made life in Singapore so much easier. 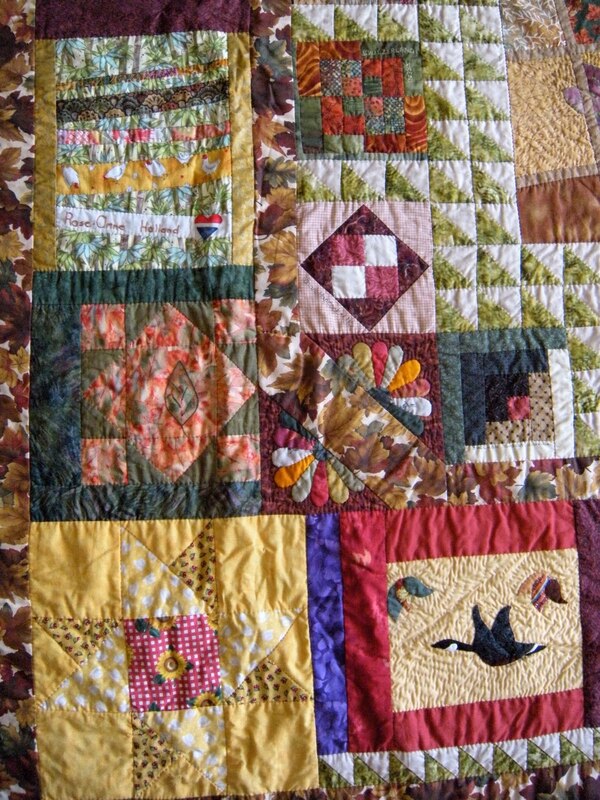 About 20 years ago, during our first posting overseas, I went to a just opened quilt shop on Johnson Ferry Road in Marietta, Georgia. 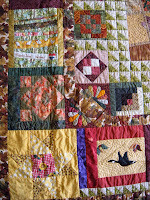 With seeing all the fabrics I wanted to learn this craft right on the spot. 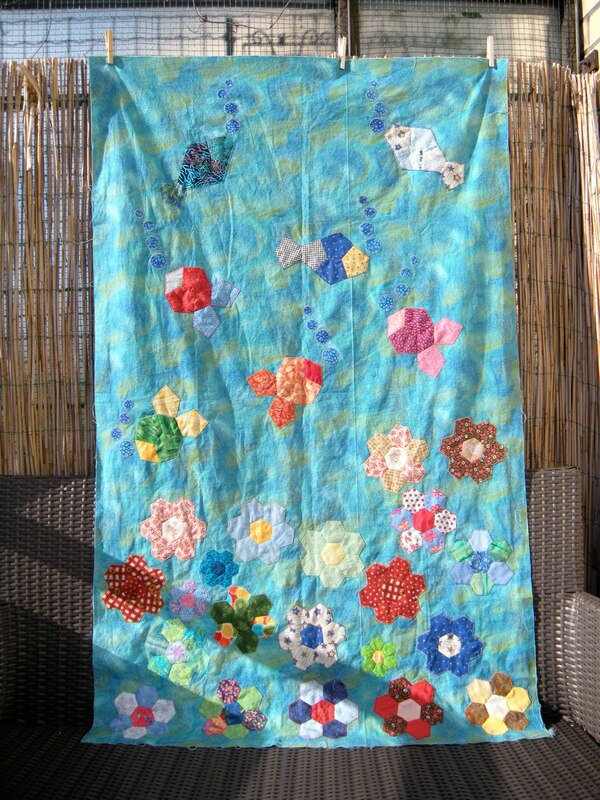 Here is where I made my sampler in very soft tone colors, very modern for those days. Unfortunately the colors have faded over the years, especially during the years in Singapore where the sun rays were stronger then I expected... Or was the quality of the fabrics in those days not as good as they are now? Bickel and Spetter, waiting to go out to the park. Okay guys, let's go! In between visits of dear friends from Singapore and Vietnam and my parents, I made the final stitches to Coming Full Circle. It is up on the wall in the living room and I like it a lot! The colors are blending in nicely with the rest of the room. 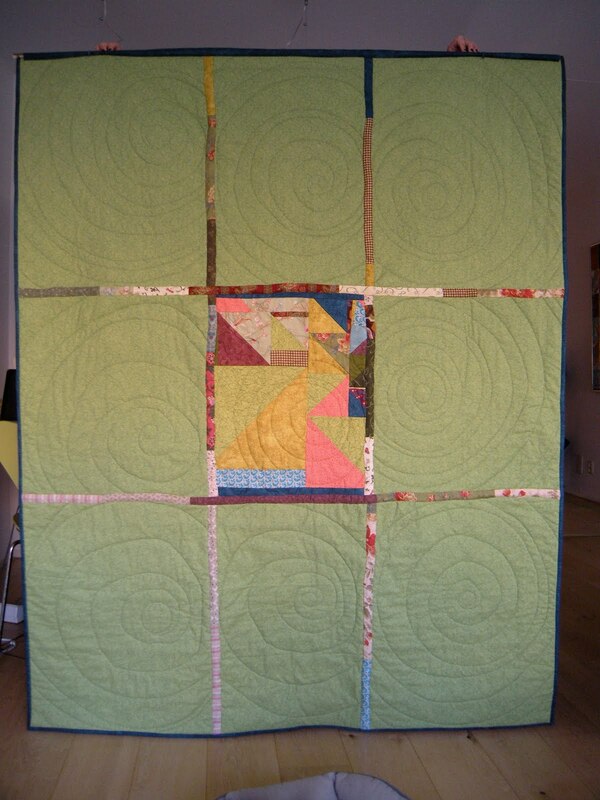 This is the back of the quilt. 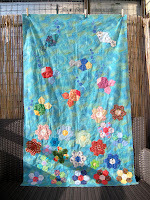 There was not enough fabric for the whole of the back, as you can see! 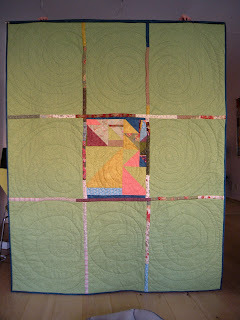 The 9 blocks were first quilted by machine and then sown together.The strips of fabric are placed on top of the seams. Because I am not sure yet when the move to Sao Paulo will take place, I better get started with a new project!